The Sony Ericsson Xperia neo V comes with a GPS receiver, which took less than 3 and a half minutes to get satellite lock from a cold start. You can use the A-GPS functionality to get near instantaneous locks or the network positioning if you only need a rough idea of your location. Our unit came with Maps 6.0.2 out of the box, which gives you access to some great features. Offline rerouting is one – if you stray off course, Maps will recalculate the route without the need for an Internet connection. You can’t change the destination without a connection though. There are also 3D buildings, two finger rotation, tilting and so on. Of course, those features aren’t available everywhere. 3D buildings are available mostly in the biggest world cities. Turn-by-turn voice guidance using Google Maps Navigation is only available in select countries and unless you live in one of them the best you can do is plan a route in advance and keep an eye on your current location during travel. Street view is, as usual, a part of the standard package - it gives you a panoramic view of every bit of road in the covered areas. With the compass mode enabled, it feels like a virtual tour of the place! Our Xperia neo V came with Wisepilot pre-installed with 30 days trial navigation license. It took it really long to get a GPS lock with every GPS setting turned on, but then it does what a SatNav software is supposed to - navigate (with voice guidance). There are weather and traffic information too. 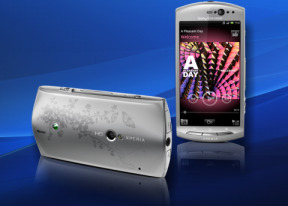 The Xperia neo V runs the latest version of Android and has a FWVGA screen, giving you access to the whole Android Market. The MSM8255 chipset should be able to handle most apps in there too. The Android Market had another visual boost lately plus a layout redesign. Now you get a few scrollable tabs - categories, featured, top paid, top free, top grossing, top new paid, top new free and trending. This organization reminds a lot of the Apple's App Store. The in-app section is untouched though and we still find it quite unattractive. A downgrade. A B-lister. You can go ahead and call it what you want. The Neo V is the only kind of damage control SE could do in the aftermath of the dramatic events in Japan that held hostage half the mobile industry. The time was up for the Neo - and quite unexpectedly too. The Neo V was called in as an emergency replacement and no one expected miracles of it. Especially since the very essence of the original Neo was the cameraphone experience, which is exactly what got downgraded this time around. So the Neo V is not the cameraphone the Neo was meant to be. And it’s not only the lower resolution stills. The 720p videos are not quite up to scratch either. So in the process of replacing the Neo, Sony Ericsson had to redefine the whole idea behind it. In the end, we received a convincing midrange smartphone that shares some of the premium features of the company's flagship – at a much more affordable price. The Neo V is a 1GHz-powered smartphone with a 3.7" screen, 5MP still camera and HD video. Guess what - this could nearly describe half the droids out there. Plenty of competition, not to mention it’s right on par with what Windows Phones currently offer. The Sony Ericsson Xperia ray is perilously close price-wise. And it’s a tempting deal. Not because of the better camera but because it's got a slimmer profile and genuinely more character. Then again - a bigger screen is definitely an asset. The Neo V's 3.7-incher beats the Ray and its 3.3" screen. The LG Optimus Black sounds quite tempting too - it has a bigger 4" NOVA display, and similar 5 megapixel camera and hardware platform. The Optimus Black costs almost the same as the neo V, so it is an excellent option if you are into big screens. So, in the end. The neo is dead. Long live, neo V? Not quite. More like - one goes down, another takes its place. The Neo V got no choice - but maybe has some future. As long as it chooses wisely what it wants to be. A cameraphone may be a long shot, but a decent smartphone – it’s quite achievable.